Hello and welcome to our live coverage of the final stage of the Volta ao Algarve. 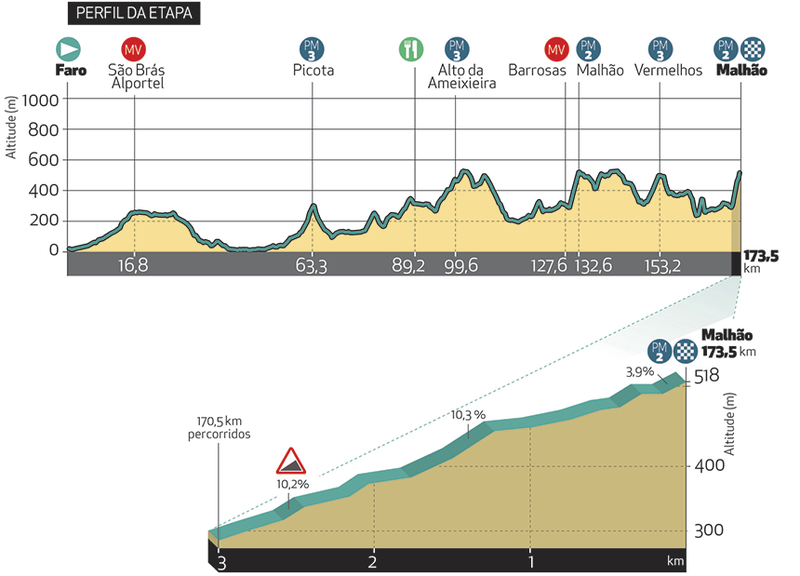 Today's stage runs 173.5km from Faro to the summit finish at the Alto do Malhão. The stage is just about to get underway in Faro, where the temperature is a pleasant 23°C. Today's final stage sees an uphill finish, four climbs on the way, and the final chance for riders to affect the general classification. Here's the map for today's stage, a twisting route inland to Malhão. The final stage of the Vola ao Algarve is underway. Six riders didn't take the start today: Arnaud Démare (Groupama-FDJ), Luke Rowe (Sky), Roy Curvers (Team Sunweb), Jasper Stuyven (Trek-Segafredo), Sérgio Paulinho (Efapel) and João Matias (Vito-Feirense). The peloton is still all together, opening the day at a high speed. On to the first sprint of the day at São Brás Alportel and it's two Cofidis riders in the first two spots. We haven't had any updates since the sprint. It seems that the peloton is still together. And just as I say that, the updates come in. A group of 13 riders has gotten up the road, and it's a strong one. Andreas Schillinger (Bora-Hansgrohe), Jonas Koch (CCC Team), Tim Declerq (Deceuninck-Quick Step), Stefan Küng (Groupama-FDJ), Jasper de Buyst, Frederkik Frison and Nikolas Maes (all Lotto-Soudal), Maarten Wynants (Jumbo-Visma), Nils Politt and Mads Würtz Schimdt (Katusha-Alpecin), Mads Pedersen (Trek-Segafredo), Kenneth van Bilsen (Cofidis), and Vicente García de Mateos (Aviludo-Louletano) are the men involved. The 13-man breakaway is 1:45 up the road. The gap is edging up – it's 2:02 now. The first hour was really fast – 47km covered. Not long to go until the first climb of the day, the third category climb of Picota. The advantage for the break is up to three minutes now. The gap is still rising. It's up to 3:40 now, meaning Küng is the virtual race leader. We're well inside the final 100km of the stage now and the gap is out over four minutes. The gap is stable at around 3:35. Over the second climb of the day, the third-category Alto de Ameixeira, and here are the results. UAE Team Emirates are leading the peloton, defending the lead of their man Tadej Pogačar. They're three minutes down on the break. Caja Rural-Seguros RGA and CCC Team are up front now too. The gap remains around the three-minute mark. The break are on Malhão now – it's the first time up the climb that we'll see again at the end of the stage. Team Sky are leading the peloton up the climb. Jonas Koch (CCC Team), Tim Declerq (Deceuninck-Quick Step), Stefan Küng (Groupama-FDJ), Jasper de Buyst (Lotto-Soudal) are the remaining riders left in the breakaway. The peloton has really closed in now. They're just 1:20 back. Mads Pedersen (Trek-Segafredo) has made his way back to the front group. There are around 40 riders left in the peloton now. CCC Team and Sky are on the front of the peloton. Amaro Antunes will be the man for CCC today. The leaders are on the penultimate climb of the day, the Alto de Vermelhos. Around a minute between the peloton and the break. De la Cruzz goes on the attack from the peloton! It's the only tactic to try and win the race given he's 57 seconds down on Pogačar. And now Mas has gone! Søren Kragh Andersen (Trek-Segafredo) has gone too. That's a strong trio of attackers. Søren Kragh Andersen (Team Sunweb) has gone too. That's a strong trio of attackers. Pedersen has dropped back from the break. Meanwhile, Steven Cummings (Dimension Data) has tried an attack. De la Cruz seems to have dropped back from the peloton to work for Wout Poels. Zdeněk Štybar, not Mas, is on the attack with Kragh Andersen. A minute separates the front of the race and the yellow jersey group. Kragh Andersen and Štybar are 30 seconds behind the leaders. De la Cruz and Cummings are with the Kragh Andersen group now. Amaro Antunes (CCC Team) tries an acceleration out of the peloton. The attack group has joined up with the break. Raúl Alarcón (W52-FC Porto) ups the pace. Nobody is escaping from the peloton at the moment, though. Štybar, Cummings and Kragh Andersen are alone out front now. Almost a minute up on the peloton. It looks like Kragh Andersen is on for the overall win here. Pogačar only has one teammate with him. The gap is a minute with 7km to race. The lead trio start the final climb of the race. They're 1:20 ahead of the peloton. Kragh Andersen and Štybar are pushing on. Antunes is attacking the peloton. Tao Geoghegan Hart (Sky) tries a move too. 1km to go for the leaders. Mas attacked Pogačar and has distanced him! The leaders are just 30 seconds up on Pogačar now! A bit of a shock given previous time gap reporting. It looks like Pogačar might save the race win here! Štybar leaves Kragh Andersen behind! he's struggling on these slopes. Pogačar needs to finish within 29 seconds of Kragh Andersen here. Zdeněk Štybar (Deceuninck-Quick Step) takes the stage win! Kragh Andersen is second, third is Poels, fourth is Mas. And Pogačar has saved it! He finishes within 20 seconds of Štybar to take the overall victory! Yeah, it was crazy fast day and my teammates really did a good job on the front all day. They were working more than 100%, so yeah I’m really proud of them and really happy to win. I panicked a bit but I knew that Petilli and Conti were still good, so it was pretty ok for us. Yeah, this is definitely a dream come true. It’s hard to believe that I won. It was a really good race. I enjoyed every moment of it so yeah, I think I’ll come back. It’s already third year in a row I was in the break on the final stage. Last year I was caught 1km to go. It was my plan to wait and help Enric Mas on the final climb. But when I saw the move from David de la Cruz and Kragh Andersen I thought it was a good time to go. I had one guy in front with Tim Declercq and I had Mas behind, so I was in a perfect situation just waiting. I am happy I could finish it off – it was a big reward for me. That's all from us today. Thanks for following along this week and for this dramatic final stage!